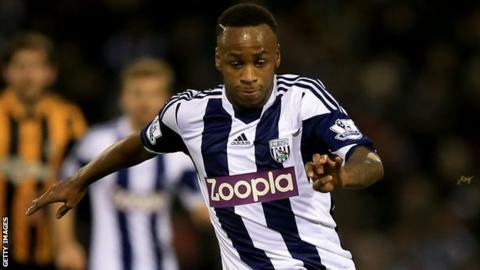 West Brom head coach Pepe Mel is adamant forward Saido Berahino has a big role to play in the club's battle against relegation. The forward, 20, has chosen not to pursue legal action against team-mate James Morrison after being punched by the midfielder. The incident took place in the dressing room after last Saturday's 3-3 Premier League draw against Cardiff. "Berahino will be important to us in the final seven games," said Mel. West Brom have played down the row involving Berahino, and no disciplinary action has been taken against any of the players involved. "They solved the situation between themselves in a perfectly natural manner, almost as if they were two brothers from the same family," said Mel. "I spoke to Saido - he perhaps seems to be more responsible than other people of his age and I told him that I trust him and trust he will continue to work well." It is believed Scotland international Morrison hit Berahino when the forward refused to apologise for a mistake which led to a late Cardiff equaliser. However, Mel said he would be happy to pick the England Under-21 international, who has scored eight goals this season including the winner against Manchester United at Old Trafford in September, for Albion's final seven matches - starting at Norwich City on Saturday. "I've been impressed with Saido, he's worked very well this week," the Albion boss said. "In addition to being an excellent player, he is also intelligent. He has shown this in training. "I've spoken to him throughout the week. He is very positive." Meanwhile, former West Brom striker Peter Odemwingie has called on Berahino to leave West Brom. The 32-year-old had a high-profile falling out with Albion in January 2013 after failing to push through a move away from The Hawthorns to Queens Park Rangers. Odemwingie, who moved to Cardiff last summer before joining Stoke in January, posted on Twitter: "I see a repeat of my situation if he doesn't leave this summer. Senior pros haha." Mel said in response to that comment: "England is a free country. Everyone can say what they like." West Brom are 17th in the Premier League, one place and three points above the relegation zone.